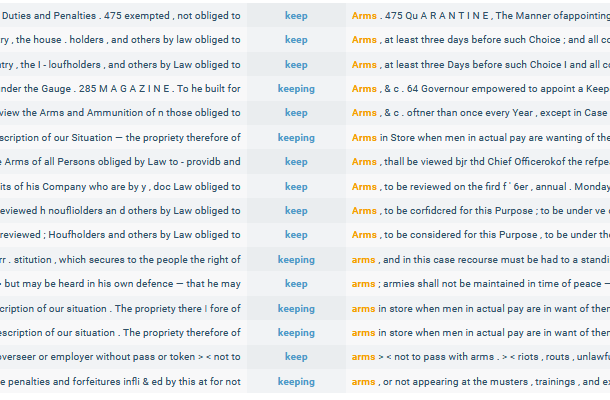 With this post, I begin my examination of the corpus data regarding the phrase keep and bear arms. My plan is to start at the level of the individual words, keep, bear, and arms, then proceed to the simple verb phrases keep arms and bear arms, and finally deal with the whole phrase keep and bear arms. I start in this post and the next one with keep. As you may recall from my last post about the Second Amendment, Justice Scalia’s majority opinion in D.C. v. Heller had this to say about the meaning of keep: “[Samuel] Johnson defined ‘keep’ as, most relevantly, ‘[t]o retain; not to lose,’ and ‘[t]o have in custody.’ Webster defined it as ‘[t]o hold; to retain in one’s power or possession. '” While those definitions could be improved on, I think that for purposes of this discussion, they adequately explain what keep means when it’s used in the phrase keep arms. So I’m not going to discuss that data with an eye to criticizing this portion of the Heller opinion. Instead, I’m going to use the data for keep as the raw material for an introduction to the nuts and bolts of corpus analysis. I suspect that many people reading this won’t have had any first-hand experience working with corpus data, or even any exposure to it. Hopefully this quick introduction will enable those people to better understand what I’m talking about when I start to deal with the data that does raise questions about the Supreme Court’s analysis. I’ll also be using this post to provide a practical introduction to the approach to word meaning that my corpus analysis will be based on. That approach is sketched out very briefly here, and in considerably more detail here. The kind of corpus analysis that I’ll be doing is based on the premise (which is shared by lexicographers) that the meanings of words arise from the ways that the words are used, and that looking at corpus data provides a good way to systematically study that usage. There are several different techniques that can be used in such an examination, of which two are relevant here. One is to look at lots of examples of the word being used in context—the word in question (the keyword) together with, say, ten words on either side of it. That method is known as KWIC, which stands for Key Word in Context, and it provides a fine-grained closeup of the keyword’s behavior. It can also be useful to look at the word’s use from a broader perspective, in order to see patterns of usage that can’t be seen in the results of a KWIC search, because of its narrow focus. That can be done by pulling up a list of the keyword’s most frequent collocates—the words that most frequently co-occur with the keyword. Such a list can be enlightening because knowing a keyword’s collocates can provide insights into its range of meanings. As we’ll see, the use of a particular collocate will often influence or even determine which of the keyword’s potential meanings is evoked by the word’s use in that context. With this format, you can quickly scan down the entries to get a quick sense of the different meanings that the people use the word to convey. And to conduct a more detailed analysis, the results can be downloaded to a spreadsheet and each line can be categorized according to whatever criteria you’re interested in. The amount of context that can be seen in the screenshot above will often be sufficient to decide how the usage in that line should be categorized. And the format makes it possible to go through the results quickly; coding 100 lines shouldn’t take more than an hour or hour-and-a-half. 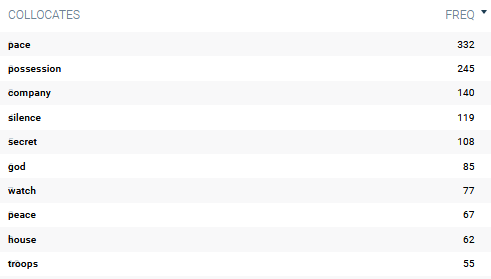 As I’ve noted, a broader view of how a word is used is available by doing a collocate search, which will give you a list of the keyword’s most frequent collocates, listed in order of their frequency, and with their frequencies provided. Such a search can be tailored in several ways. First, you can either limit the search to a specific form of the keyword (e.g., keep but not keeps, kept, or keeping), or you can do a single search (called a “lemmatized” search) that covers all of those word forms. Second, you can limit the search to collocates that occur in a specified position in relation to the keyword (before, after, or either one) and to collocates that appear within a specified distance from to the keyword (immediately adjacent; within two words, within three words, etc.). Finally, you can limit the search to collocates belonging to a specified part of speech (nouns, adjectives, whatever), although the part-of-speech tagging process sometimes makes mistakes. And however the search is structured, you can call up a KWIC display for each collocate by clicking on it. These lists of collocates provide significant information about how keep is used, and that in turn yields significant insights about its semantics. The asterisks indicate that in the absence of something unusual in the context, these sentences are ungrammatical. And what makes them ungrammatical is that they are semantically incomplete. To devour, to say, to use, or to keep is necessarily to devour something, to say something, to use something, or to keep something. So the verbs in these asterisked sentences need to be accompanied by words that denote the necessary something. Words or phrases that perform that function are referred to as the complement of the verb. Complements can take different forms. Probably the most well known type of complement is a noun functioning as the verb’s direct object: Susan devoured the brussels sprouts; Bill held a bag of groceries in his arms ; Kris used a hammer. But complements can also take other forms: Bill forgot to tell Susan that the brussels sprouts were ready. He is becoming increasingly forgetful. In addition to fleshing out the verb’s meaning, the complement often determines which of the verb’s possible meanings is evoked in a given context. The meaning of devour in Susan devoured the brussels sprouts is different from its meaning in Susan doesn’t like reading mysteries, but she devours science fiction. Similarly, using a hammer is a different kind of activity than using a computer, and throwing a baseball is different than throwing a baseball game. The most common of the three patterns is keep+Adjective, for which the 100 most frequent collocates account for 3,125 corpus lines). The next-most common pattern is keep+Noun (2,589 lines in the top 100), and finally keep+Verb (707). I’m going to discuss each category in turn, but I’ll start with keep+Verb because it’s the simplest, and save keep+Noun for last because it’s both the most complicated and the most interesting. From this list we can see that at its simplest, the pattern keep+Verb manifests itself in phrases such as keep stirring, keep moving, keep shaking, keep burning, keep running, keep standing, keep doing, and keep going. The people at Norfolk behaved undevoutly at meeting, kept running out, talking whispering, laughing, gazing about, & c.
In these examples, and others like them, the meaning of the phrase keep VERBing as a whole is determined compositionally—the meaning of the phrase is a function of the meanings of the individual words and the way that they are syntactically combined. Most people unfamiliar with linguistics or philosophy of language (and certainly most lawyers and judges) probably assume that this kind of compositionality is the norm. Under that assumption, words have preexisting meanings and are simply inserted into grammatical slots, like numbers assigned to variables in a mathematical equation. One immediate difficulty for this assumption is that many words have a variety of possible meaning, so there has to be some way to explain how the appropriate meaning gets selected when the insertion takes place. And one of the important insights that has emerged from the use of corpus analysis in lexicography has been that the meaning of a word in a given context is affected by the context. And that interaction between word meaning and context can be seen in the corpus data that I will be discussing. (b) Being, in effect, disarmed, he was seized and pinioned, and kept standing, in his shirt only, in that cold season, the space of an hour. As is true of the intransitive examples discussed above (keep stirring, keep shaking, keep moving) additional examples of keep being used in transitive constructions are easy to find in the corpus data. Here are a few, with the reference to the causal agent being underlined and the reference to the affected object being italicized. By a light that I kept burning I then sat down to copy the minutes I had taken in the course of the preceding day. What all of this suggests is that when keep+Verb appears as part of an intransitive construction, its meaning can be summarized as ‘continue to [Verb]’ or ‘continue [Verb]-ing’, but when it appears as part of a transitive construction, its meaning can be summarized as (roughly) ’cause [something] to continue to [Verb]’ or ’cause [something] to continue [Verb]-ing’. Thus, we see a difference in meaning being associated with a difference in grammatical context, and vice versa. That is challenging for the notion that words have predefined meanings, independent of the contexts in which they appear. And it raises questions such as whether there is a strict dichotomy between word meaning and grammar, and whether the focus in analyzing meaning should be on some unit larger than the individual word. Given that the pattern keep+Verb is the least frequent of the three patterns I’ve been looking at, one might wonder how much significance to attribute to the results above. But the behavior of the transitive examples of the pattern is mirrored in the behavior of the pattern keep+Adjective, which is the most frequent of the patterns I’ve been discussing. In particular, the semantic or conceptual core of the two patterns’ meaning can be described as what I’ll call CAUSATION OF CONTINUATION. Hot Weather melts my Marrow within my Bones, and makes me faint away almost. I have no other Way to keep alive, but by Abstinence from Eating and drinking. it would be improper for me to mention in this Letter Things which ought to be kept Secret. Shou’d they however be imprudent enough to make the attempt , I shall keep close upon their heels, and do every thing in my power to make the project fatal to them. In some of these examples, the activity or force that brings about or enables the continuation is specified: keeping alive “by Abstinence from Eating and drinking”, keeping furniture clean “by scouring and washing”. But more often, the activity or force isn’t identified and has to be inferred based on the context, with greater or lesser specificity. For example, keeping a window open is the result of refraining from closing it, keeping two things separate can result from putting each one in a different place or from putting a barrier between them, and keeping close to someone results from moving in such a way as to be continuously close to them as they move from one place to another. As the discussion so far suggests, constructions following the pattern keep+Adjective present much the same challenge to compositionality as do the transitive examples of keep+verb. As I’ve said, the data for keep+Noun is more complicated and more interesting than the data for keep+Verb and keep+Adjective. In both of the latter categories, there was variation with regard to the degree of compositionality and semantic transparency of the specific constructions that we’ve looked at. But for the pattern keep+Noun, the range of variation is much greater. At the same time, though, I think that the conceptual building blocks that I’ve referred to as CONTINUATION and CAUSATION OF CONTINUATION play a role—or should I say “keep playing a role”— in the meaning of each example of the pattern. I’m going to discuss some of the words that are among the 100 most frequent noun collocates, ordered more or less according to the degree of compositionality displayed by each construction, starting with those that are the most compositional and moving to those that are the least. to prevent the Indians from doing mischief, and promised to endeavour to influence all that tribe to keep peace. can not be where I am of use to my country, I beg to resign. Despite my best efforts to keep peace on board, the men are determined not to sail with the Captain except to America. THE guards are to be vigilant and alert, and do their utmost to prevent disorder, and keep peace, ever attentive to the security of the camp. In some of these cases, the “transitivity” is explicitly encoded, as in “keep peace among the rest of the slaves“. In other instances, however, it has to be inferred, as in “my best efforts to keep peace on board” and “the guards are to be vigilant and alert, and do their utmost to prevent disorder, and keep peace “. That they desired by all just means to keep peace, if it may be, with all men even with these barbarians. These uses seem to me to combine elements of both transitivity and intransitivity. The condition of continued peace characterizes the relationship between the referent of the subject and the other party, so that it is experienced both by the referent of the subject (as in the intransitive uses) and by the other party (as in the transitive uses). Keep watch is interesting, because although it uses the noun watch in a way roughly corresponding to the verb watch, its meaning can’t be summarized as simply ‘continue watching.’ If someone were merely watching something happen over a period of time (for example, watching a play or a horse race), one wouldn’t say that they were keeping watch. Rather, keep watch means something close to keep guard. It typically involves staying alert to one’s surroundings so that one can take appropriate action if some particular kind of event happens (usually something bad). Moreover, the action of keeping watch or keeping guard often occur as part of an organized or at least planned activity, rather than as something that one just happens to do. And in fact, keep watch was sometimes used in a specialized sense to denote what the OED describes as “the action of keeping guard and maintaining order in the streets, esp. during the night, performed by a picked body of the community”. Keep pace is similar to keep watch. Although pace can be used as a verb (e.g., “to move with a measured or regular step; to walk or stride along steadily” [OED]), keep pace doesn’t mean continue pacing. Rather, its meaning is explained by the OED as “to maintain the same speed of movement; to advance or progress at an equal or (occasionally) sufficient rate; to keep up with“. We now come to the sense of keep having to do with continued possession of a tangible object, as in keep arms. You might have thought that this was was its literal or central sense, or the one that was most common, but if so, the discussion so far may have disabused you of that notion. As is true of the keep+Verb and keep+Adjective constructions, the common element running through all the keep+Noun constructions we have looked at has been the element of (CAUSATION OF) CONTINUATION, not of POSSESSION. The only use having anything to do with possession was keep possession, which actually undercuts any suggestion that the idea of POSSESSION is part of keep‘s central or most basic meaning. After all, if keep‘s central meaning had to do with POSSESSION, you wouldn’t expect to see the construction keep possession—especially not as the second most common example of the pattern keep+Noun. And the continued-possession sense of keep strikes me as being semantically incompatible with the patterns keep+Verb and keep+Adjective. As far as I know, verbs and adjectives aren’t used to denote tangible objects. (Although nouns denoting tangible object can of course be verbed—as in Beryl headed a pass from Macdonald to the right wing—the resulting verb denotes the event rather than the object.) As for the issue of frequency, the patterns keep+Verb and keep+ Adjective each occur in COFEA more than three times as often as keep+Noun. And within the latter category, the continued-possession sense is fairly uncommon. Of the hundred most frequent collocate-pairs, keep arms is the only one to have this meaning (although, as we’ll see, there are other pairs in which continued possession plays a role). Keep arms is number 29 on the frequency list, and it appears in the corpus only than 5% as often as number 1 (keep pace). If I’m right in thinking that (CAUSATION OF) CONTINUATION is at keep’s semantic core, the meaning of constructions like keep arms seems hard to account for in compositional terms. The meaning of the whole is different—more complex—than the sum of the meanings of the two parts. And that has been true to varying degrees of the other constructions we have looked at. This raises the question whether it makes sense to talk about the meanings of phrases such as keep arms as if they arise from merely combining the preexisting meanings of the two independent words. That’s an issue that I will return to in the next post in this series. But before I close out this post, I want to talk about a number of constructions whose meanings pose an even greater challenge to the idea of compositionality. for the County of Plymouth be impowered (if they see cause) to grant the abovenamed Samuel Brown a Licence to keep Tavern. A person who undertakes the employment of keeping school ought to be competent to the business in which he engages. What think you of your daughters comeing to keep House for you? Thus with 7 servants and hireing a chore woman upon occasion of company, we may possibly make out to keep house; with less we should be hooted at as ridiculous and could not entertain any company. Sir Willam Phips was a New-England man, born at Pemaquid in 1650, where he kept sheep until he was 18 years old, then was an apprentice to a ship carpenter. It is expensive keeping a Family here. whole bill of cost was exacted of every one of them, which each of them must pay down, or be kept prisoners till they did, though all seven of them were jointly informed against in one information. Thus Mr. In two other usages, keep concubines and a kept woman, the most prominent element of meaning was that of exploitation for the keeper’s personal benefit. These usages also probably evoked the element of providing sustenance or support, since that was presumably part of the “bargain” between the two parties. This brings us to a pair of repugnant usages, in which are combined all of the various elements that we have seen in the constructions I have been discussing: possession, confinement, exploitation, and (solely as a necessary condition of those three) provision of food and housing. I am referring to keep slaves and the even more disturbing keep negroes (with negroes acting as a metonym for slave). This reasoning looks something plausible, I confess; but the holy scripture approves of making and keeping slaves; and this surely is sufficient to keep us in countenance. At this point, I hope you’ll indulge me in a digression. The parallels with usages involving the keeping of farm animals are striking, given that similar parallels characterized the way that slaves were treated and regarded. That parallel was obvious to 18th-century abolitionists, who referred to slaves as being treated like “human cattle”. That’s not surprising, but what is surprising is that the human-cattle metaphor was endorsed shortly before the Civil War in an essay supporting slavery. Or maybe it’s not really surprising; after all, the notion that slaves were subhuman animals was a part of pro-slavery ideology. In any case, I will conclude with a rather chilling fact of etymology. As you may know, the form of slavery in the American colonies and then the United States was known as chattel slavery—a reference to the fact that people who were enslaved were regarded as a form of salable property. Chattel was, and to some extent still is, a legal term for tangible property other than real estate. Well, it turns out that chattel and cattle are etymological siblings. They were both borrowed from the Old French word for ‘property’, which existed in two regional variants: catel, from Norman French, and chatel from Parisian French. Catel was used in vernacular speech, and its meaning narrowed to mean ‘livestock’ and ultimately to mean ‘cows and bulls’. Meanwhile, chatel was the form used in legal Anglo-Norman, which is more widely known as Law French, and it retained the original meaning. I will leave to others the question whether this etymological relationship has any historical significance. In my next post I will step back from this close-up view of the corpus data, and will address the broader significance of what that examination has revealed. As I’ve noted, the lists of keep‘s 50 most frequent verb collocates, adjective collocates, and noun collocates exclude collocates whose Mutual Information score was negative. The Mutual Information score for a given combination of words is intended to measure the difference between the frequency with which that combination appears in the corpus and the frequency that would be expected based solely on the respective frequencies of the individual items. For some reason, many of the combinations that had negative Mutual Information scores were irrelevant for purposes of my analysis here. In some cases, for example, the word’s part-of-speech tag was inaccurate. In others, the collocate did not function as the complement of keep. The words and other items that were excluded on this basis are as follows. Nouns: time, us, people, nothing, order, ∣, mr, store, copies, life, others. Verbs: said, is, according, was, are, standing, be, united, let, hold, laid, having, ing, observed, provided, were, being. Adjectives: more, many, great, several, whole, proper, better, small, large, public, late, much, other, young, little. This entry was posted in "keep", Corpus linguistics & constitutional interpretation, Dictionaries, District of Columbia v. Heller, Law and corpus linguistics, Law and linguistics, Originalism, Scalia, Second Amendment. Bookmark the permalink.